Nature’s Sunshine ALJ® provides protection for the respiratory system against potentially harmful airborne particles. The formula nourishes the body’s cleansing mechanisms and immune system to help them be able to fight any challenges from these particles. 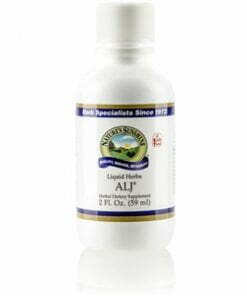 ALJ promotes proper lung function and assists the body through seasonal changes. It contains boneset aerial parts, fennel seeds, fenugreek seeds, horseradish root extract, and mullein leaves extract. ALJ comes in capsule form or in easily absorbable liquid extract. Instructions: Adults: Take approximately 20 to 30 drops (1-2 ml) in water every 2 to 4 hours. Children: Take approximately 10 to 20 drops (0.5 to 1 ml) in water every 2 to 4 hours. A natural and pure extract composed of the finest boneset aerial parts (Eupatorium perfoliatum), fenugreek seed (Trigonella foenum-graecum), horseradish root (Armoracia rusticana), mullein leaves (Verbascum thapsus), and fennel seed (Foeniculum vulgare) in vegetable glycerin.